When most people think of running, they chalk it up in their minds to be this huge ordeal in which they should be huffing and puffing, bent over with hands on knees at every stop light, and drenched in sweat about 30 seconds in – sound familiar? In fact, this is the experience that a lot of people have. Why? Because they’re basically going out for a sprint, not a run. Running should not leave you completely and utterly exhausted at the end of it EVERY TIME you finish. Take professional runners for instance, they have “easy run days” and “workout days” and these are two very different things. Easy run days are for recovery and are always at conversation pace. This means you could hold a fairly normal conversation without breathing too heavily. Workout days are times when the pros are working on their overall strength and endurance, or their speed. These are much harder efforts and almost always involve interval training of some kind. So where do you come in? The majority of beginner runners have not mastered the art of the “easy run”. Most people end up running WAY too fast at the start of their run and then feel completely spent several minutes in which either elicits unnecessary walking shame, hatred of running, or both. The fix? Scale it Back. Try running a lot slower than you normally do for a few runs and see what it does to your overall energy level and ability to cover the distance. If you use a GPS watch, try going a whole minute per mile slower. Or, if you have a loop that consistently takes you 25 minutes, try dragging that out to 28-30 minutes. You just might find you’ve been running faster than you should have been all along. The fix? Stick it out. This may not be what you want to hear but I promise that if you truly give your running routine 4-6 weeks (no cheating! ), you’ll find out what all the hype is about. You run 2 miles, every other day, around the same loop in your neighborhood, listening to the same playlist, at precisely 5:35pm. Sounds…fun? A lot of people whom have gotten over the consistency piece of running, and have found their “easy day” speed, are just simply bored out of their minds every time they go for a run. You wouldn’t eat the same dinner every day, or watch only one show on Netflix your whole life (oh the horror! ), so why are you doing the exact same thing every time you go for a run? The fix? Mix it up! Whether it is your route, time of day, or distance, try changing something up. 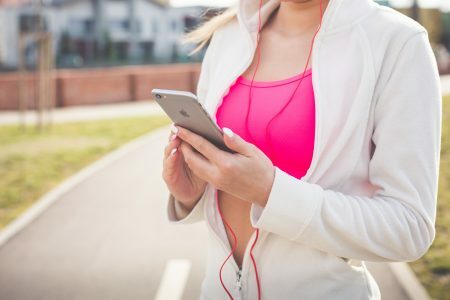 For music, Fit Radio offers over 100 new workout mixes per month, including holiday-themed mixes, and all genres to keep your playlist fresh and you coming back for more. Not to mention Pace Matching BPM with your footstrike which means that every time your foot hits the ground, it’s on the beat. How cool is that? Another great way to mix up your runs is intervals. Intervals can be scaled down or up to fit every ability level so they don’t have to be intimidating! Intervals are a great addition to any runners’ weekly plan and are good to substitute for an easy run 2-3 times a week. These kinds of workouts burn more fat, can help improve your overall aerobic capacity, and will boost your metabolism! Plus, you’ll feel amazing. And by amazing I mean that “I’m so tired but feel like a bad a**” amazing.